SigFox is a narrowband (or ultra-narrowband) technology. It uses a standard radio transmission method called binary phase-shift keying (BPSK), and it takes very narrow chunks of spectrum and changes the phase of the carrier radio wave to encode the data. The coverage of SigFox is here. Here there is a Sigfox Overview. Modulation: 2(G)FSK, 4(G)FSK, OOK, ASK and -140 dBm. Ready for: Sigfox, Wireless M-Bus, 6LowPAN and IEEE 802.15.4g networking connectivity, simplifying the design of IoT applications and enabling remote sensors to directly connect to the cloud without the need for a local gateway. STSW-S2LP-SFX-DK is an evaluation SW package for SigFox networking with the S2-LP high performance, ultra-low power RF transceiver. It is designed to operate in the majority of radio configuration zones (RCZ) described by SigFox. 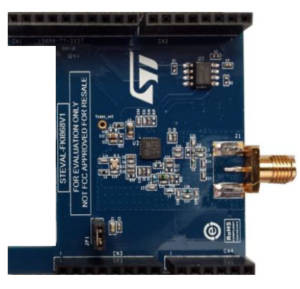 The STSW-S2LP-SFX-DK SW package supports the STEVAL-FKI868V1 (868MHz) and STEVAL-FKI915V1 (915MHz) kit platforms available on corresponding web pages.